Idi Amin was born in 2 different places in the West Nile Province of what is now the Republic of Uganda, and he had 2 birth days. Idi Amin was born in northwest Uganda in 1925 or 1926; that his birthdate is imprecise illustrates the marginalization and isolation of the peoples of that part of Uganda under British colonial rule. His name at birth is disputed among researchers. In time he was to be known as Idi Amin Dada. The 250-pound president called himself Dada, or "Big Daddy". Idi Amin was born into the small Kakwa tribe in Koboko, a village in northwestern Uganda. His mother was a self-proclaimed sorceress of the Lugbara tribe and he was in his 30's before he had regular contact with his peasant father. There are different accounts about his place of birth. In some accounts, he claimed to have been born at the place where the International Conference Center stands today. Others say he was born in Koboko to a Kakwa father and a Lugbara mother. His actual year of birth is not clear too. It is said that he was born between 1925 and 1928. Amin’s childhood was a total wreck because he was abandoned by his mother when he was still a baby. He, however survived the street-wise way, selling snacks and doing casual work to earn a living. He received little formal education and pursued a career in the army from a young age. In 1946, Amin, who had hobnobbed with soldiers in his early life, courtesy of his mother’s marriage to a Kings African Rifle Clerk, joined the Kings African Rifles. It is not clear whether he joined directly as a soldier; however some sources claim that he was first recruited as a kitchen cook. But soon, he became a real soldier. It was while with the KAR that the word 'Dada' was added to his name because he kept mentioning it whenever he greeted a lady. In between soldiering, he enjoyed different sports activities, including boxing in which he rose to the level of a National Heavy Weight Champion, he tried out athletics as a sprinter and played rugby. He was all the time jolly. Amin was deployed by the British to participate in the counterinsurgency war against the freedom fighters in Kenya, and there he engaged in brutality and wanton murder against Africans. Based in the Muranga region of Kenya between 1953 and 1956, Amin learned all of the techniques of low-intensity warfare when the British incarcerated more than 1.5 million Kenyans and hanged thousands. 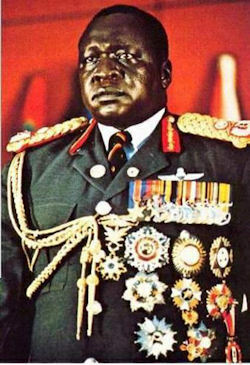 Idi Amin was both a pugilist and militarist; from 1951 to 1960 he was the light heavyweight boxing champion of Uganda. He also rose through the colonial army, eventually attaining the rank of effendi (warrant officer), the highest rank that a black African could attain in the KAR at that time. The Uganda that became independent in 1962 was plagued with deep divisions based on regional, religious, and ethnic alliances. By the time Uganda got her independence, Idi Amin was one of the leading soldiers who formed the first Uganda independence army. By 1964 he had been named Deputy Army Commander while Shaban Opolot was the Army Commander. Milton Obote then deployed him to help the Katanga rebels who were fighting against Zaire government. Later, it emerged that Amin had indeed sold gold and diamonds given to him by the rebels in return for arms. Much later, the issue went before parliament for debate; however Obote snuffed it in the bud by arresting all the ring leaders, hence saving himself and Amin. Having struck a 'wonderful' chord, when Obote fell out with Kabaka Fredrick Muteesa, it was Idi Amin, then a Colonel of the army that he turned to for survival. Amin was promoted rapidly in the Ugandan army, becoming general and commander in 1966. On 24th May 1966, Obote sent a force commanded by Idi Amin to attack the Lubiri in order to bring the Kabaka alive or dead. Amin carried out this order diligently. By 1969 the social divisions in Uganda had deepened to the point where Obote’s government increasingly depended on the military to maintain its power. While he obeyed his master’s orders to the letter, Amin had his personal ambitions up his sleeve. For example, he was recruiting hundreds of his kinsmen into the army. These were to come in handy later when he decided to take over high office. Among these included Sudanese and Congolese. By the early 1970s, Amin had created a sizeable force within the Uganda Army that could answer to his whims and Obote recognized this too. A fall out started and finally, it culminated into the 1971 coup. At that time Obote wanted to arrest Idi Amin for various cases including murder. Major General Amin used his men to stop the move and was soon declared President while Obote was attending a Common Wealth Conference in Singapore. There was jubilation when Amin captured power, largely because Obote had lost popularity. But soon, it was noticed that Amin was not the savior the country thought he was. Nonetheless, he started off by releasing all political prisoners who had been imprisoned by Obote. He appointed an all inclusive cabinet, full of professionals and experts-which were hailed by both local and international commentators. But underneath this all, there was murder going on-especially of Langi soldiers in the Uganda Army. According to various accounts, over 1,000 soldiers from Privates up to the rank of Colonel were murdered in the first days after the coup. Outside the army, the first few years of Amin`s regime saw the murder of several prominent personalities including Ben Kiwanuka (Attorney General). Uganda was one of the lesser-known African countries until the 1970s when Idi Amin Dada rose to the presidency. The people of the east African nation initially welcomed Mr. Amin's rise to power. He was a boxer and an ex-soldier in the British colonial army who won cheers at home for his frequent taunting of Uganda's former colonial rulers. His bizarre public pronouncements - ranging from gratuitous advice for Richard Nixon to his proclaimed intent to raise a monument to Adolf Hitler - fascinated the popular news media. Beneath the facade of buffoonery, however, the darker reality of massacres and disappearances was considered equally newsworthy. Uganda became known as an African horror story, fully identified with its field marshal president. Amin's eight years in power in Uganda, 1971 to 1979, were marked by extreme human rights abuses. He ran his landlocked country of 24 million people with an iron grip, killing both real and imagined enemies and awarding himself an array of medals. Vast numbers of people were tortured and killed so rapidly that graves could not be dug fast enough, and corpses were dumped into the Nile River. Bodies of the Amin regime's victims sometimes were fed to crocodiles. Occasionally human remains clogged intake pipes at Uganda's main hydro-electric plant at Jinja. Human rights groups say up to 500,000 Ugandans were killed by Mr. Amin's regime. By 1972, the economy which he had found in a good condition was shriveling. He had already caught up with religious extremism and had shifted from being a 'darling' of the Western world- UK, to the East, especially Russia. He claimed to stand for the Palestinian cause and vowed to fight for it. However, it was his 'dream' to chase away the Asians, who hitherto owned most key businesses that shook the world. He gave them just 90 days to leave or perish. Many of them left, others did not, but instead chose to commit suicide. Asian businesses were then distributed amongst his cohorts. That sent the country spiraling into economic chaos. He then embarked on building his army as one of the best in Africa at the time, with fighter planes MIGs from Russia, tanks among others. He was so smitten with his abilities that he threatened to fight the 'imperialists' in South-Africa and the Israelis from Palestine. In 1974, he got an international respite when he held the OAU conference in Kampala. Notable developments at the time included the construction of both Nile Hotel and Nile Mansions to host the conference. While killings continued unabated, Amin further took his antics to the international level. In 1976, he allowed a high-jacked Air France Plane, bound for Israel to land at Entebbe airport. The Israelis however attacked and rescued their citizens a few days later. His claim on land at the border with Tanzania, and earlier claims of land at the border with Kenya continued. But Amin's well-publicized excesses at the expense of Uganda and its citizens were not unique, nor were they the earliest assaults on the rule of law. They were foreshadowed by Amin's predecessor, Milton Obote, who suspended the 1962 constitution and ruled part of Uganda by martial law for five years before the military coup in 1971 brought Amin into power. Amin's bloody regime was followed by an even bloodier one - Obote's second term as president during the civil war from 1981 to 1985, when government troops carried out genocidal sweeps o the rural populace in a region that became known as the Luwero Triangle. The dramatic collapse of coherent government under Amin and his plunder of his nation's economy, followed by the even greater failure of the second Obote government in the 1980s, raised the essential question-'"what went wrong?" The Tanzanians and various exile groups wanted to get rid of Amin. By April 1979, Amin had been defeated. Amin fled to Libya where he was offered asylum, but after an altercation between his security guards and the Libyan police, he was forced to leave at the end of 1979. He then accepted asylum in Saudi Arabia, settling in Jiddah. The international human rights group Amnesty International says Mr. Amin's two decades of comfortable exile underlines the need for a system to bring tyrants to justice for crimes against humanity. Idi Amin died at King Faisal Specialist hospital on August 16, 2003. He had been hospitalized on life-support systems since July 18. He was in a coma and suffering from high blood pressure when he was admitted to the hospital. Later, hospital staff said he suffered kidney failure. Officially, Amin had five wives, all of whom he treated as 'First Ladies' at different functions. They included Kay Amin, Nora Amin, Medina Amin, Sarah Amin and Malyamu Amin. The number of children he fathered is above 30. Among the titles Amin gave himself were "President for Life," "Lord of All The Beasts of the Earth and Fishes of the Sea" and "The Last King of Scotland," which became the title for an award-winning novel on which the film is based. In this mix of fact and fiction, history turns on a chance encounter between the Ugandan leader and a volunteer doctor from Scotland. Rising young Scottish actor James McAvoy co-stars as Garrigan, a fictional character based on several real Europeans who were advisors to Amin. Garrigan becomes the President's personal physician and close confidante; but with this front-row seat, the young doctor watches in horror as the promises of change give way to atrocities. Much of the film was shot on location in Uganda and Forest Whitaker says working with people who experienced the Amin years helped him grasp the duality of the character he played. "When you talk to the people of Uganda, they have a dual opinion of him," Whitaker says. "There are people who hate him and there are people who really admire him like a hero. There's a large group that say they know all these murders and atrocities occurred, but he did all these great things. He did things that clearly were wrong to do, but I think his intention in the beginning was to try to change the country."